Adult prom, 8 p.m., at Veteran’s Memorial Civic Center, 7 Town Square, Lima. Tickets are $30 for a single and $50 for a couple. They are available at the door. 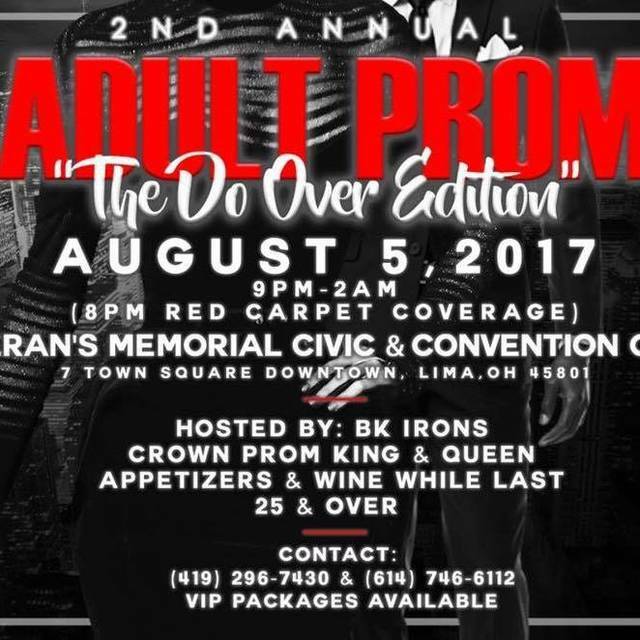 LIMA — The second annual adult prom will be held at 8 p.m. Saturday, Aug. 5, at the Veterans Memorial Civic Center, 7 Town Square, Lima. Tickets are $20 advance purchase at destinypartybus.com or $30 for a single and $50 per couple at the door. The adult prom is for people ages 25 and over, no exceptions. The event features cash bar, party favors, red carpet, “prom” photos with a photo booth, door prizes, DJ and the crowning of prom king and queen, which is judged by the audience. For more information, contact Destiny Party Bus at 614-746-6112 or visit its Facebook page, limaadultprom. This entry was tagged 080517. Bookmark the permalink.